For most of history, frames were practically an afterthought to everyone but artists—a backdrop to greater paintings and drawings. Artwork was typically given a new frame whenever it changed hands or if the owners did some redecorating and wanted a new frame to match. In fact, that debate continues today among those who work in the arts. For some, choosing a frame is a way to personalize art or customize it for a space. Others feel artwork looks best in contemporary frames, matching what the artist would have envisioned. Still others draw on different framing styles to get the look they want. Post-Impressionist painter Henri Matisse, who said the four sides of a frame were “the most important parts of a picture,” sometimes incorporated Renaissance frames into his work. Whatever their view, museums, historians, collectors, and framers have been taking a closer look at how frames were created, the history behind them, and how trends have changed. Here’s a brief look at some of the highlights and how it could inspire your next framing project. The earliest frames were simply drawn in, but wooden frames date back as far as the first century A.D. — during the Roman Empire. Some have been unearthed in Egypt, preserved alongside mummies. These early frames were typically basic, not carved, and inseparable from the picture; the painting and frame were created on the same piece of wood. Some used mortise-and-tenon joints — a way to connect two pieces of wood that’s still used by craftsmen today. 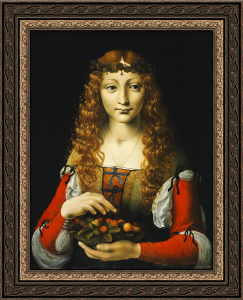 More elaborate frames started to make an appearance during the Renaissance period (1300s to 1600 A.D.), the time of Italian masters such as Leonardo da Vinci, Michelangelo, and Sandro Botticelli. A tabernacle frame looks structural, like a small building: An ornate top and base supported by pillars on both sides. The design was based on treatments around doors and windows, which typically reflected the classic style of the ancient Greeks and Romans. During the Renaissance, frames started to get fancy. They were often gilt or decorated with precious metals or stones, ivory, pearls, or tortoiseshell veneer. Craftsmen were also picky about the wood they used. Walnut was a favourite, partly because it was good for carving but also because of its rich brown colour; other woods were sometimes stained to match. In other words, art from the Baroque period (1600 to 1750 A.D.) is typically ornate and bold—and that includes picture frames: They were more dramatic, with lots of detail and ornamentation. Massive gilded frames were also popular. 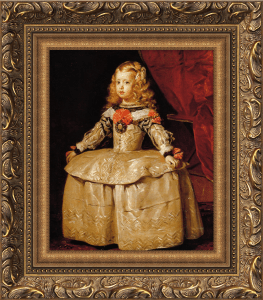 The Italians had an influential hand during this period, too—particularly in France, where the Italian-born Marie de’ Medici briefly served as regent for her son, Louis XIII. Nature was a common theme; leaves in particular were often used as embellishments. One stand-out style, called the Sansovino frame, is “characterised by carved overlapping scrolls, garlands of fruit, masks, broken pediments, and sometimes cherubs,” according to London’s National Gallery. In the 1800s, frame design became more simplified. A growing middle class meant more people owned art; frames needed to be easier to produce. A material called composition, or “compo,” started to replace wood ornamentation. Compo is a casting material that’s durable, high quality, and can be pressed into molds then added to a more basic wooden frame. Instead of carving frames, carvers started to create intricate molds (which ultimately killed demand for carved wooden frames). These molds could create bold ornamentation or very subtle, fine textures. As mass production took over in the late 1800s, many artists rebelled: To them, the frame was an integral piece of their artwork. Some impressionist artists, such as Edgar Degas, designed simple geometric frames. Some Surrealist artists, such as Salvador Dalí, built on the frames they used as part of their works. That reclaimed ownership didn’t settle the framing debate, however—and it actively continues today. But the emergence of digital frames and art galleries at least makes flexibility and experimentation easier. How do you choose a frame when the choice is almost endless? When both artwork and frames are digital, you’re left with one thing: An overwhelming choice of options. How do you narrow down to the style? How do you pick the best frame? First, carefully investigate the artwork so you can better understand the style, colours, history, and emotions it represents. What style of art does the work represent? What are its characteristics? Does (or did) the artist have a preference? Will the composition support an ornate style of frame, or would it be overwhelmed? What type of matting would help enrich the work’s perception and emphasize its advantages? What frame style does your customer typically prefer? 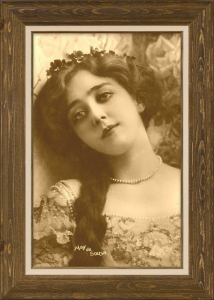 Picture frame styles evolve over time, and we can only guess what will come next! 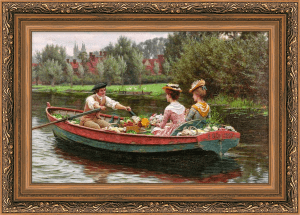 However, with proper attention, care, and consideration of the rich history of framing, you’ll find your own approach and style for picture frames. 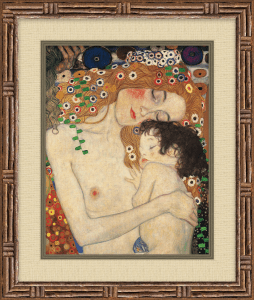 Mac application for adding photorealistic frames to photos and images of art.